Caribbean Group Cruise 2019 a Success! Thanks to all those that went on our fabulous group cruise this winter. 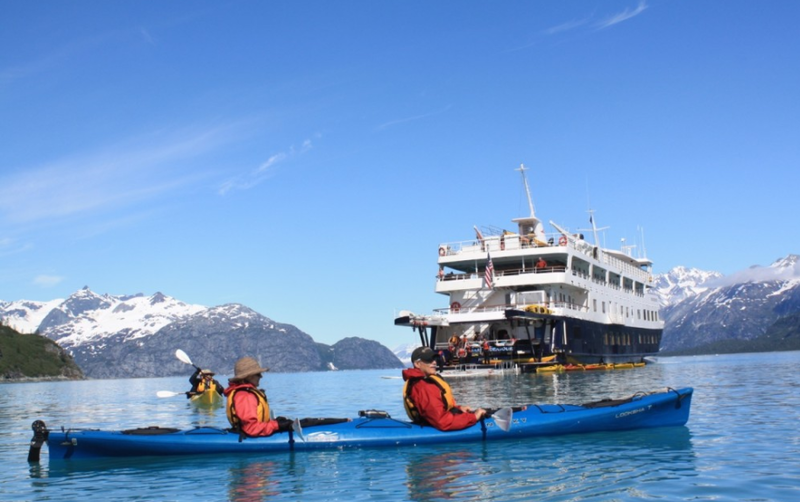 It was great to have so many new cruises along! You can now see why we all get addicted to traveling and having others along makes for even more fun. We started out in Galveston, Texas. Most of the group shared a rented beach house for two nights prior to the cruise. We boarded Royal Caribbean’s Liberty of the Seas and cruised for 7 nights with port stops at Cozumel, Grand Cayman and Jamaica. The ship was enormous, the staff was stellar and the food was great. We had two large tables in the dining room for our group and had an outstanding waitstaff to take care of us. I’m in the beginning stages of putting together a group cruise for winter 2020 right now. Please contact me if you are interested in joining us next year. Stay tuned for the announcement! The AmaMagna, will be the same length, height and draft as the line’s other vessels, but at 22 meters it will be twice as wide, allowing for larger cabins — most about 300 square feet — with a capacity for 194 passengers (40 more than Crystal Mozart). Its width also means it will be the only ship docked in ports that allow two-deep berthing. The new ship will feature ocean-style cabins, multiple dining venues (including outdoor dining), an elevator that goes all the way to the top of the ship, a heated top-deck pool and hot tub with bar, expanded entertainment and spa offerings and a water sports platform with zodiacs, canoes and other recreational equipment. The ship will be green, using propulsion that’s a hybrid of diesel and electric engines. In total, there will be 10 small engines, with just four used for propulsion. If more power is needed, electric ones will be used. Construction began on March 6 at Vahali’s headquarters in Belgrade, Serbia. When the hull is completed, the vessel will be finished at the company’s facility in Holland. Because its size will prohibit it from being towed directly to Holland by tugboat, it will instead be taken by freighter via the Black Sea. Emerald Waterways new "Deposit Protection Plan"
To allow some flexibility for our guests, they are now offering a Deposit Protection Plan. What is this NEW Deposit Protection Plan? The Deposit Protection Plan (DPP) is a form of coverage offered by Emerald Waterways that protects the deposit amount paid on an Emerald Waterways cruise. To participate in this program, the cost is $125/pp USD and must be paid with the deposit on the Deposit Due Date. The Deposit Protection Plan is non-refundable and non-transferrable and cannot be added past the Deposit Due Date. The DPP also only covers Cruise or Tour deposit, it DOES NOT cover Air deposits. When guests choose to cancel or change their cruise departure date for any reason prior to the final payment due date as per the terms and conditions, the value of the Deposit Protection Plan paid will be charged as a fee. Additionally, any third-party supplier fees incurred by us (i.e components provided by third parties such as, but not limited to, hotels) will be subtracted from the deposit amount and we will credit the remainder towards an alternative cruise. This must be booked within 24 months of the cancellation. If guests do not book within the 24-month period advised, the deposit amount held on file will be forfeited. The DPP does not, nor does it intend to, replace travel insurance. Emerald Waterways highly recommends all guests purchase travel insurance prior to leaving for their vacation. If a guest declines the DPP at the time of booking, this will be noted on their reservation and will not be allowed to be added after the Deposit Due Date. If guests who have purchased the DPP cancel after final payment due date, the Deposit Protection Plan is no longer valid. Their standard cancellation policy will apply to cancellations made after final payment due date. The cancellation fees will be advised by the Cancellations Team after cancellation in writing is received. Guests who cancel prior to the final payment due date but have NOT taken out the Deposit Protection Plan than the deposit remains non-refundable and non-transferrable. For more information, contact your Emerald Waterways Specialist, Pete Larson. 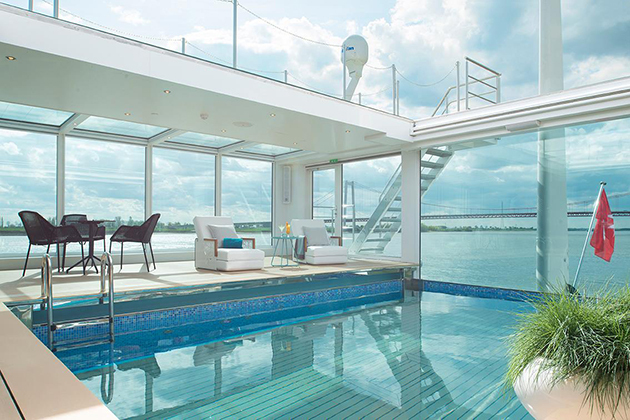 The fifth in the Emerald Waterways’ Star Ship fleet, the 186-guest Emerald Destiny includes the line’s indoor balcony in most cabins, complete with decked area and an open-air system as well as a swimming pool and cinema on the ship’s aft. It is one of three Emerald Star Ships to be launched this year, bringing the total fleet to seven. Emerald Liberté, which will sail the Saône and Rhône rivers in France, will launch in April. The Liberté can host 138 guests and offers all the same amenities as the Destiny, including the swimming pool and cinema. Emerald Radiance, which carries only 112 passengers, will traverse Portugal’s Douro River and will launch in May. 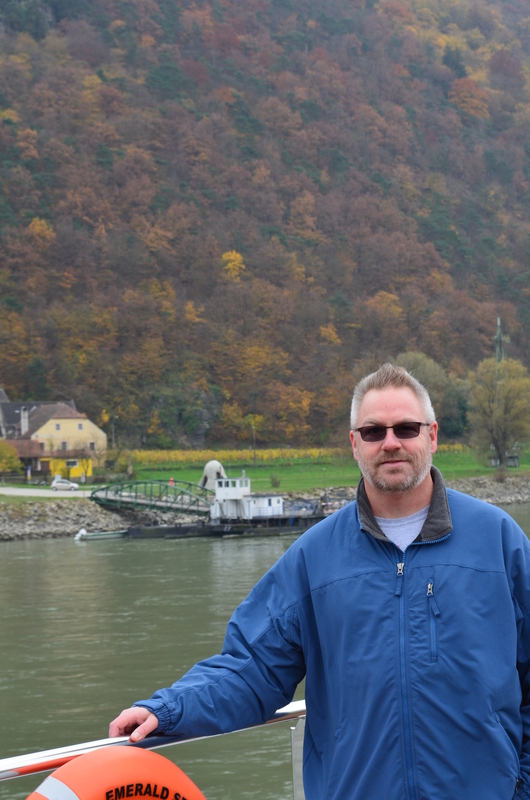 Contact Pete today for free assistance with your river cruise! Jolly Mon Vacations and River Cruise Guru are proud to be affiliated with the brand new Travel Leaders Network! Travel Leaders Network — one powerful force to help us compete even more effectively for the hearts and minds of the traveling public. As the largest seller of luxury travel, cruises, river cruises and tours in the travel agency industry, we will have unparalleled and cohesive strength within the greater travel industry. Vacation.com, the largest travel agency consortium; Travel Leaders Associates (also known as Travel Leaders Franchise Group), a leading agency franchise group; and Results! Travel, a smaller franchise group, will be merged to form a mega-travel agency group with nearly 7,000 locations, 35,000 individual agencies and $17 billion in annual sales, including $6.5 billion in cruise and tour sales alone. The merger will be effective Jan. 1, 2017. Cheers to a great 2017…and beyond! From the regal cities of Amsterdam, Vienna, Budapest, Frankfurt, Paris, Bordeaux and Basel, explore the Danube, Rhine, Main, Moselle, Seine, Garonne and Dordogne rivers on Crystal River Cruises with gorgeous, ever-changing panoramas of enchanting villages and lush landscapes. In-depth explorations and overnight stays in the heart of Europe’s cities and towns provide a vibrant and memorable experience. The hallmarks of the Crystal brand – service, space, quality and choices – usher in a new era in European river exploration with Crystal River Yachts. With its signature All-Inclusive philosophy, Crystal offers an encompassing luxury experience: butler service for every suite; six-star service and truly exceptional food; unique Crystal Adventures that deliver memorable destination experiences – all working in synch to transpose the World’s Best Ocean Cruising to the World’s Best River Cruising. Crystal will redefine luxury river cruising. Gratuities included for all shipboard staff throughout the River Yacht including housekeeping, bar, dining staff and butlers. 24-hour Wi-Fi access (via satellite) including free Wi-Fi/Internet usage of 60 minutes per person, per day. – Airport/River Yacht – Transfers will operate between 8am and 6pm on embarkation day. Actual service times may vary depending on local traffic conditions and guests’ arrival schedules. – River Yacht /Airport – Transfers will operate until at least 12 noon on the day of disembarkation. Actual service times may vary depending on local traffic conditions and guests’ departure schedules. Contact River Cruise Guru today for more information and COMPLIMENTARY ASSISTANCE! No booking fees, lowest price possible. We are with you every step of the way. River Cruises are my Specialty! What is there to do on a cruise ship? Norwegian Cruise Lines has stepped things up with many innovative and fun things to do onboard. 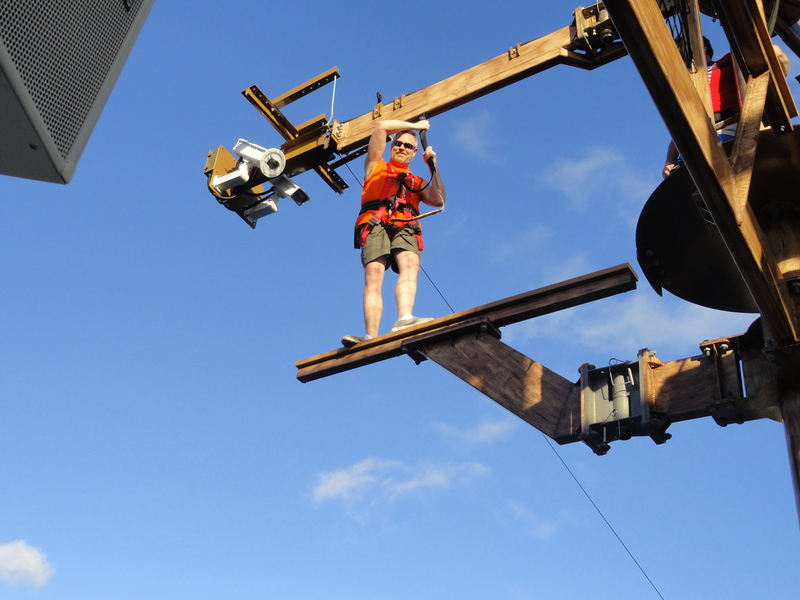 On a two or three story ropes course, you can zip line and even walk the plank over the side of the ship! A great adrenaline rush. They also have the fastest water slides at sea. And when they say fast…they actually take your breath away! Far better than any I’ve been on anywhere. Mini golf, loads of other water features, rock climbing walls, basketball, fitness centers, spa, Broadway shows, comedy, live music, magic, exquisite dining, bars, and even a fireworks show to cap off the night. And that’s just some of the things on board. Wait until you get to the islands! Jolly Mon Vacations knows the ships and itineraries well. We assist you in finding the right ship for you and your family at no cost to you. Lets get your adventure started! 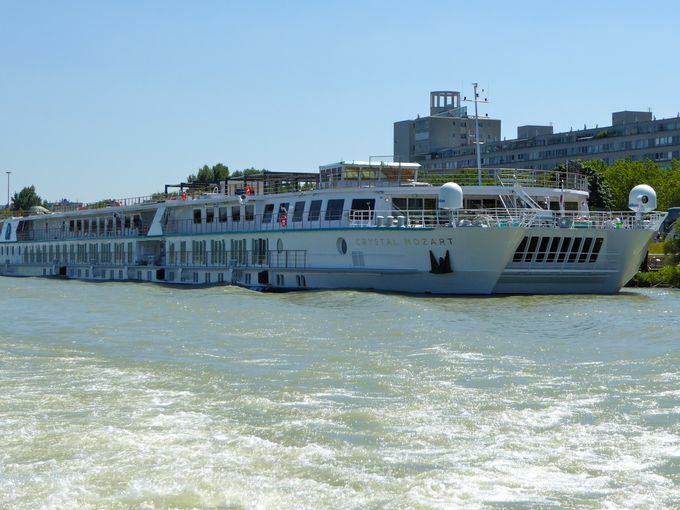 Why should I go on a river cruise? European river cruising is the fastest growing segment of the travel industry, and here’s why. The itineraries pack as many as four countries into a 7 night cruise, with a chance to wake up somewhere new each day. How cool is that? Over the past three years, more than fifty new river vessels have taken to the water, with around twenty more due this year. The season runs from March to December– with special Christmas Market and New Year’s departures. You can find many theme cruises as well, from wine and art to history and beer. Holiday market cruises are spectacular, as you can visit the famous markets, sip Gluhwein and shop in the brisk but festive atmosphere. With spectacular scenery, charming villages and cities such as Amsterdam, Cologne, Nuremberg, Vienna and Budapest, it’s easy to see why the Rhine, Main and Danube attract the highest number of cruisers. Other popular rivers include the Seine, where ships are based in Paris and cruise to Normandy, and the Rhône, for trips through Provence between Lyon and Arles. Or you can cruise the Elbe from Berlin to Prague, the Moselle through Germany’s wine-growing heartland, Italy’s Po or Portugal’s Douro. There are many options to fit the discerning traveler. One of my favorites is the Moselle (or Mosel) as pictured below. I stood in a castle when I took this picture! 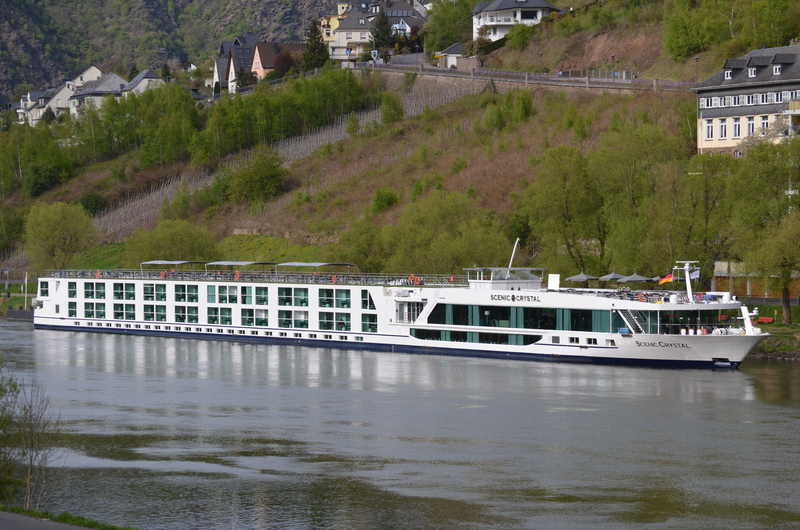 The size of European river cruise vessels is limited by low bridges and narrow locks, so compared with ocean-going ships they’re small and friendly, carrying less than 200 passengers. The on-board atmosphere tends to be relaxed, with no strict dress codes and usually open seating at mealtimes. All meals come as standard and the majority of lines also offer free daily excursions. All-inclusive river cruise lines are available, with drinks and tips included in the fare. As vessels tend to moor right in the heart of towns and cities, it’s easy for passengers to explore on their own if they feel like opting out of organised excursions. Many lines carry bicycles you can take and explore the river, the towns or cities at no extra cost. The top lines, such as Scenic Cruises, offers a GPS guided device you can take along while you explore on your own. It gives you directions and acts as your mini tour guide telling you about the sites you are seeing. Many river cruise lines cater to English speakers, so there is no worries about language barriers. Its a great way to explore Europe and unpack only once. We are certified River Cruise Specialists. We do not charge you any fees and will help you every step of the way. Your package can include your arrangements from the time you leave your doorstep to the time your return there. Call us today. Don’t miss out on one of the greatest ways to travel Europe at a great value. Margaritaville at sea! On a cruise ship. Norwegian Cruise Line’s next new ship, Norwegian Escape, which will be based in Miami, will have Jimmy Buffett’s Margaritaville restaurant and the 5 O’Clock Somewhere Bar on board. Margaritaville will be a complimentary restaurant on the Norwegian Escape, which will debut in Europe next October and begin week-long Caribbean cruises out of Miami starting Nov. 14. The 5 O’Clock Somewhere Bar will be an outdoor bar on the ship’s Waterfront zone and will feature live music nightly. Norwegian’s new port at Harvest Caye, Belize, will have a Margaritaville when it opens next fall, and a 5 O’Clock Somewhere Bar will open next year on Norwegian’s Great Stirrup Cay in the Bahamas. Margaritaville eventually will be expanded to the rest of the fleet, but details haven’t been set yet, said Vanessa Lane Picariello, Norwegian’s director of public relations. Contact us to get your cruise booked! No fees for planning and booking, so you save time and money!